I’m Oliver Hannan, the founder of SLYSTEEL. I founded SLYSTEEL in late November, 2013 with an idea for a unique knife design that would serve its owner in the most demanding circumstances without failure. That knife is the SLYSTEEL Shark Tooth Tactical. I also designed the smaller, but no less capable knife, Shark Tooth Hunter to share the patented Split Finger Guard handle design. I brought my knife designs to Mike Fuller and Leo Espinoza at TOPS Knives. Because of the impressive lineup of TOPS Knives, their uncompromising commitment to quality, and a reputation for creating tools that serve military, law enforcement, security, martial arts, and outdoor professionals, Mike and Leo receive dozens of unsolicited design submissions each year. While the vast majority of those submissions are declined after careful consideration, a select few make it into the prestigious TOPS lineup. Thanks to Leo’s help in completing a marketable design and Mike’s willingness to work with a startup company, the SLYSTEEL Shark Tooth knives made the grade and proudly carry the TOPS name as the manufacturer. Mike and Leo invited me to introduce these new knives at the Shooting, Hunting, and Outdoor Trade (SHOT) Show in Las Vegas, Nevada in January 2014, where they introduced me to many influential people in the knife industry. Among those I met were knife designers, survival experts, writers, and magazine editors. One editor I met was Bethany Miller, Editor for Knives Illustrated Magazine. During our short time together at the SHOT Show, I explained the design impetus for the unusual Split Finger Guard handle on the Shark Tooth knives. Upon my return to Idaho Falls, I had the pleasure of sending out press packages. A couple of months past and as the SHOT Show receded into my memory I received a call from a now familiar number; it was Mike Fuller. Mike asked me if I had seen the latest issue of Knives Illustrated Magazine, to which I replied that I hadn’t. He suggested that I purchase several copies because the SLYSTEEL Shark Tooth Tactical knife was named Editor’s Choice in the Knives Illustrated Magazine article, The Best of SHOT 2014. Needless to say I was overjoyed and proceeded to buy every copy of the magazine I could find in Idaho Falls. It is an honor to have a knife design included in the pages of such an amazing magazine. But it is truly a once in a lifetime opportunity and honor when that design is the very first attempt at designing a knife. 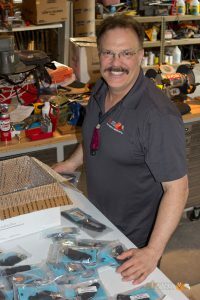 As I said before, my introduction to the knife industry would not have been possible were it not for the kindness and consideration of special people like Mike Fuller, Leo Espinoza, and Bethany Miller. It all started with a simple idea of creating a knife that would protect the user’s hand and not fail them in an emergency. That idea led to the creation of SLYSTEEL and The Edge of Innovation™.